A friend recently told me that seeing a movie I made over forty years ago is a holiday tradition in his family "like putting up the Christmas tree." 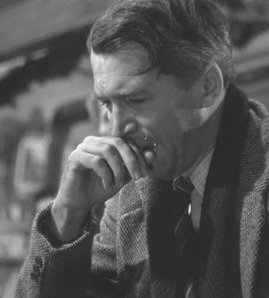 That movie is It's A Wonderful Life and out of the eighty films I've made; it's my favorite. But it has an odd history. When the war was over in 1945, I came back home to California from three years service in the Air Force. I had been away from the film business, my MGM contract had run out, and frankly, not knowing how to get started again, I was a little bit scared. Hank Fonda was in the same boat and we sort of wondered around together talking and flying kites and stuff but nothing much was happening. Then one day Frank Capra phoned me. The great director had also been away in service making the "Why We Fight" documentary series for the military and he admitted to being a little frightened too. But he had a movie so we met to talk about it. He said the idea came from a Christmas story written by Philip Van Doren Stern. Stern could't sell the story anywhere but he finally had 200 twenty-four page pamphlets printed up at his own expense and he gave them to his friends as a greeting card. "Now listen," Frank began hesitantly. He seemed a little embarrassed about what he was going to say. "The story starts in Heaven and it's sort of the Lord telling somebody to go down to earth because there's a fellow in trouble and so this heavenly being goes to a small town..." Frank swallowed hard and took a deep breath. "Well, what it boils down to is this fella, who thinks he's a failure in life, is thinking about jumping off a bridge. The Lord sends down an angel named Clarence, who hasn't earned his wings yet, and Clarence jumps into the water to save this guy. But the angel can't swim so the guy has to save him and then..." Frank stopped and sighed, "This doesn't tell very well does it?" I jumped up and said, "Frank, if you want to do a picture about a guy who jumps off a bridge and an angel named Clarence who hasn't won his wings yet comes down to save him, well, I'm your man!" Production of It's A Wonderful Life started April 15, 1946 and from the beginning, there was a certain something special about the film. Even the set was special. Two months had been spent creating the town of Bedford Falls, New York. For the winter scenes, the special-effects department invented a new kind of realistic snow instead of using the traditional white cornflakes. 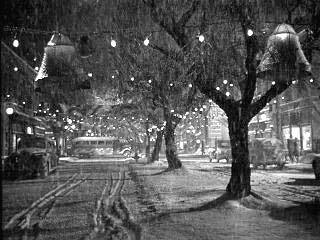 As one of the longest American movie sets ever made until then, Bedford Falls had 75 stores and buildings on four acres with a three block main street that was lined with 20 full grown oak trees. As I walked down that shady street the morning we started work, it reminded me of my hometown, Indiana, Pennsylvania. I almost expected to hear the bells of the Presbyterian Church where Mother played the organ and Dad sang in the choir. I chuckled, remembering how the fire siren would go off and Dad, a volunteer fireman, would slip out of the choir loft. If it was a false alarm, Dad would sneak back and sort of give a nod to everyone to assure them that none of their houses were in danger. I remembered how, after I got started in pictures, Dad, who'd come for a visit to California, would ask, "Where do you go to church around here?" I stammered, "I haven't been going - there's none around here." Dad disappeared and came back with four men and said, "You must not have looked very hard, Jim because there's a Presbyterian church just three blocks from here and these are the elders. They're building a new building and I told them you were a movie star and would help them." And so Brentwood Presbyterian was the first church I belonged to out here. Later, that church was the one in which Gloria and I were married. Then after we moved, we attended Beverly Hills Presbyterian, a church we could walk to. It wasn't the elaborate set that made It's A Wonderful Life so different; it was the story itself. 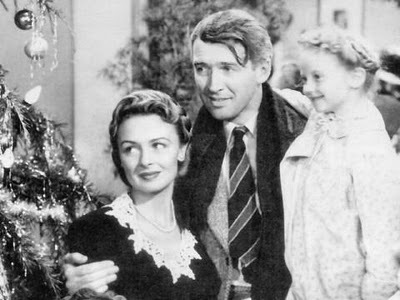 The character I played was George Bailey, an ordinary kind of fella who thinks he's never accomplished anything in life. His dreams of becoming a famous architect, of traveling the world and living adventurously, have not been fulfilled. Instead he feels trapped in a humdrum job in a small town. And when faced with a crisis in which he feels he has failed everyone, he breaks under the strain and flees to the bridge. That's when his guardian angel, Clarence comes down on Christmas Eve to show him what his community would be like without him. The angel takes him back through his life to show him how our ordinary, everyday efforts are really big achievements. 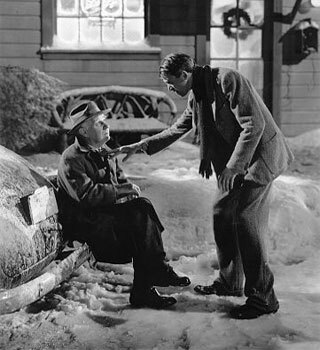 Clarence reveals how George Bailey's loyalty to his job at the Building and Loan Office has saved families and homes, how his little kindnesses have changed the lives of others and how the ripples of his love will spread through the world helping make it a better place. Good as the script was, there was something else about the movie that made it different. It's hard to explain but I, for one, had things happen to me during the filming that never happened in any other picture I've made. In one scene, for example, George Bailey is faced with unjust criminal charges and not knowing where to turn; he ends up in a little roadside bar. He is unaware that most of the people in town are arduously praying for him. In this scene, at the lowest point in George Bailey's life, Frank Capra was shooting a long shot of me slumped at the bar in despair. In agony I raise my eyes and following the script, I plead, "God... God..Dear Father in Heaven, I'm not a praying man but if you're up there and you can hear me, show me the way. I'm at the end of my rope. Show me the way, God." As I said those words, I literally felt the loneliness and hopelessness of people who had nowhere to turn. My eyes filled with tears and I broke down sobbing. This was not planned at all, but the power of that prayer and the realization that our Heavenly Father is there to help the hopeless had reduced me to tears. Frank, who loved spontaneity in his films, was ecstatic. He wanted a close-up of me saying that prayer but was sensitive enough to know that my breaking down was real and that repeating it in another take was unlikely. But Frank got his close-up anyway. The following week he worked long hours in the film lab again and again enlarging the frames of that scene so that eventually; it would appear as a close-up on the screen. I believe nothing like this had ever been done before. It involved thousands of individual enlargements with extra time and money. But he felt it was worth it and in fact; quite necessary. There was a growing excitement among all of us as we strove day and night through the early summer of 1946. We threw everything we had into our work. Finally, after three months, shooting some 68 miles of 35-millimeter film we completed the filming and had a big wrap-up party for everyone. It was an outdoor picnic with three-legged races and burlap-bag sprints, just like the picnics back home in Pennsylvania. At the outing, Frank talked enthusiastically about the picture. He felt that the film as well as the actors would be up for Academy Awards. Both of us wanted it to win, not only because we believed in its message, but also for the reassurance we needed in this time of starting over. But life doesn't always work out the way we want it to. The movie came out in December 1946, and from the beginning we could tell it was not going to be the success we'd hoped for. The critics had mixed reactions. Some liked it ("a human drama of essential truth"); others felt it "too sentimental ...a figment of simple Pollyanna platitudes." As more reviews came out, our hopes sank lower and lower. During early February 1947, eight other current films including, Sinbad the Sailor and Betty Grable's The Shocking Miss Pilgrim, outranked it in box-office income. The postwar public seemed to prefer lighthearted fare. 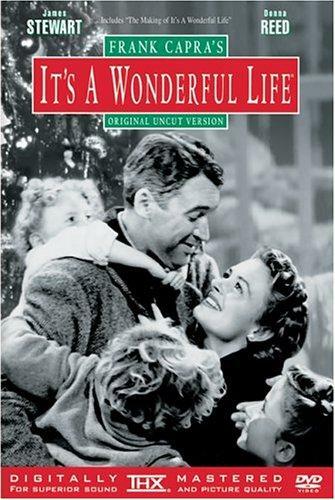 At the end of 1947 It's A Wonderful Life ranked 27th in earnings among the releases that season. And although it earned several Oscar nominations, despite our high hopes, it won nothing. Best Picture for 1946 went to The Best Years of Our Lives. By the end of 1947 the film was quietly put on the shelf. But a curious thing happened. The movie simply refused to stay on the shelf. Those who loved it loved it a lot, and they must have told others. They wouldn't let it die any more than the angel Clarence would let George Bailey die. When it began to be shown on television, a whole new audience fell in love with it. Today, after some forty years, I've heard the film called an American cultural phenomenon. Well, maybe so, but it seems to me there is nothing phenomenal about the movie itself. It's simply about an ordinary man who discovers that living each ordinary day honorably, with faith in God and a selfless concern for others, can make for a truly wonderful life.